2. Blue Gray Sky then explores the "sprint" or "stretch" run play. 3. Pro Football Reference blog compares AFL and NFL drafts. 4. New Detroit Lions' coach Jim Schwartz refuses to read books written by women. I recommend Margaret Atwood. 5. Creative types flocking to the internet, where fame can be instant but fleeting. 1. T. Kyle King has an interesting response to my incoherent musings on business and life in college football. 2. 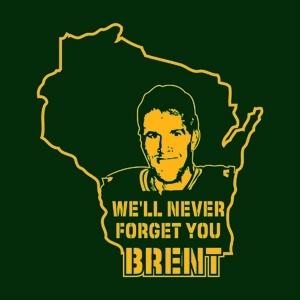 Dan Shanoff really doesn't believe Brett Favre. 3. Blutarsky is bringing the Mummepoll back. Get ready. 4. Steve Kragthorpe is determined to purge the University of Louisville of all things Brohm. 5. Captain Leach doesn't twitter, and reiterates his support for a 64-team college football playoff. I will say this: there would be some wild football, with every game a do-or-die. Some frantic, last minute wildness, every week. It might be infeasible, but the more I hear this idea the more I think it does sound fun. 6. Best thing you'll see in awhile. 7. USC's use of coaching consultants is questioned. 8. Finally, I'll be traveling today, but check out Dr Saturday as I should have a post up there later this afternoon, fitting in with the Doc's Big 12 week. The quarter[back] is, under the captain, the director of the game. With the exception of one or two uncommon and rare plays, there is not one of any kind, his side having the ball, in which it does not pass through his hands. The importance of his work it is therefore impossible to overstate. He must be, above all the qualifications of brains and agility usually attributed to that position, of a hopeful or sanguine disposition. He must have confidence in his centre himself, and, most of all, in the man to whom he passes the ball. He should always believe that the play will be a success. That is Walter Camp, in his 1893 book, American Football. On Tim Tebow at the next level . . .
Q. As somebody who has coached in the NFL, I was wondering what your take is on Tebow’s NFL prospects? Do you think he’s talented enough to warrant a top 10 pick? COACH SABAN: Well, you know, I don’t think it’s fair for me to judge that because I can’t really judge who the other guys in the top 10 are. Being involved in the draft before, if you’re not involved in the total body of work, it’s very difficult to make those kind of predictions. But I will say this: I think Tim Tebow is an outstanding quarterback, an outstanding leader. I have no questions about his ability to throw the ball. He made some outstanding throws in good coverage in critical times in our game last year in the SEC championship game. So I have a tremendous amount of respect for him as a quarterback, as a leader, as an athlete, in every regard. I think he is a winner. I think he will be a winner in the NFL. But I think everybody needs to understand that the NFL struggles to evaluate people who don’t do in college what they look for guys to do in the pros. And I don’t think they should be criticized for that. It’s a difficult evaluation when you play a little different kind of offense. I think Florida has a great offense. I think it’s very difficult to defend. I think they do a great job of executing it and coaching it. So I’m not being critical. But it is different. And that makes it more difficult. You know, a general manager sent me a letter saying, How are you learning all the spread quarterbacks, how the dynamics of the critical factors of the quarterback position have changed because this offense has changed, what are you doing differently to evaluate quarterbacks, because we’re having a more difficult time evaluating players that play in that offense? It affects everyone. The quarterback, as well as the left tackle. If somebody told me we don’t know how to evaluate this guy because he’s never played in a three point stance because he always plays in a two point stance because they’re no huddle, and they’re always in a spread. So it’s every position that is different from what they would like to see because they have a defined prototype they would like to evaluate toward. When you play in a different type of offense, it makes it more difficult to evaluate. I don’t think anybody is disrespecting him, I guess is what I’m trying to say. I think it’s just a little more difficult to try to evaluate. On the "Spread" offense . . .
Q. Talk about the impact of the spread offense on defenses in college football. COACH SABAN: Well, I just think that it’s very difficult to defend. I think when the quarterback’s a runner, you create another blocker, or a receiver that you have to cover. So that kind of creates another gap on defense. And I think that that’s very difficult to defend. But I think it’s like anything else: the multiples of what you have to defend are what make it more difficult to defensive players. Just like in the old days when they used to run the wishbone. When you had to play against the wishbone, that was really different. So it was difficult to get the picture and look of what you needed to do to get your team prepared to be able to play against it. I think to some degree the spread offense is the same way. A no huddle offense is the same way. How do you get a scout team in practice to be a no huddle team to get any kind of execution so that the defensive players start to develop the mentality they need to be able to change their routine and play without a huddle? So I think the concept of the spread offense is outstanding because it makes the quarterback an 11th gap on defense, I always say. If you only had to defend that all the time, I think we could all get a little better at it. It’s the multiple of the different things you see throughout the season that make it more difficult. On the disruption of an inexperienced QB . . .
Q. From a defensive point of view, when you’re facing a quarterback that doesn’t have much experience, how do you try to take advantage of that? At the same time with an inexperienced quarterback this year, how do you try to guide him through games until he gets that experience? COACH SABAN: Well, you know, I think that everyone develops at a little different pace and rate, depending on their ability to learn the knowledge and experience, how they learn from their lessons. And I think specifically in our case Greg McElroy learns very quickly and has had some experience. But I also understand that until he makes plays in the game, he’s not gonna fully have, you know, the trust and respect of all of his teammates, even though they really, really like him and they really like him as a leader. I think the biggest mistake you can make in development of any new player, young player, inexperienced player, is give him too many things to do, and increase the multiples of the kind of mental errors that they can make. I think that it depends, from a defensive perspective, who the guy is that you’re trying to defend. If he’s a smart guy, if you try to pressure him, you may enhance his chances of making plays because he understands it, he sees it, and his reads actually become a little easier. If you try to play all coverage against him and don’t pressure him and he’s a good runner, he may hurt you with his feet. So I think to really answer that question effectively, you’d have to know the specifics of who you were trying to defend. Q. Can you tell us a little bit about the 2001 game between you and Kentucky and talk about the last play specifically. COACH SABAN: Well, what I remember, most people don’t remember the little things and the details of why things happen sometimes, but there was about a 30 mile an hour wind that day, and we were fortunate to be able to game manage to get the wind in the fourth quarter by the way the coin toss went and all that stuff. We practice these two plays every Thursday at the end of practice. I forget the exact seconds, but we ran the first play because we could stop the clock and gained about 15 or 20 yards. Hit Michael Clayton on an in route, then had to go up top. But the ball sailed and almost went 70 yards in the air because we had a big wind. The Kentucky players actually misjudged the ball. That’s what created the tip. Devery Henderson was the key running guy that’s supposed to play the tip. And it just worked out that way. But what I remember the most from it was not that play. I’ve always been told by mentors, that the worst thing your team can do is play poorly and win. And we played poorly that day and won. And we got our rear ends kicked in the worst defeat in all the time I was at LSU the next week because of that. That’s what I remember the most. So you didn’t expect that answer, did you (smiling)? Jim Johnson, Philadelphia Eagles defensive coordinator extraordinaire, has passed away due to cancer. Johnson coached some great defenses, and of course his legacy will be carried on by guys like Steve Spagnuolo who learned under him. Johnson was a 4-3 guy, and while his protégés took many lessons from him, he will be remember for his aggressive, blitzing defenses. Spagnuolo is more of a zone-blitz guy, but Johnson was always willing to play man defense and blitz safeties and linebackers from anywhere. Indeed, as I've mentioned before, Johnson essentially put the first nail in Steve Spurrier's coffin when his Eagles defense blitzed Spurrier's Redskins -- fresh off a thirty-point game in their opener -- into utter oblivion. From then on, every coach in the league had that tape to put in. Johnson figured out exactly what protections Spurrier was using, and dialed up the right blitzes. But Spurrier was hardly alone in being schooled by Johnson. UPDATE: Brophy passes along some great game film (below), and Rock M Nation tips me off to this. 2. How science can save you from choking. This new bit from Jonah Lehrer is a nice complement to my earlier post on football decision making and the brain. Kenny Perry could taste history. He had a two-shot lead with two holes to go at the 2009 Masters - all he had to do was not make any big mistakes and he would become, at 48, the oldest Masters champion in history. For three days at Augusta, he had played the best golf of his life: on the first 70 holes, he made only four bogeys. But then, at the 71st hole, everything started to fall apart. . . .
A little experience, however, changes everything. 5. Monte Kiffin would like to remind you again that he will outwork you. You know, just in case you forgot. Hello! Plaxico Burress is going to jail. . . . [T]he NFL community -- and not just fans -- seem rather blind to the reality that Plaxico faces gun charges with a mandatory minimum sentence and the prosecutors do not appear interested in granting him grace, and so he is going to serve some real jail time. Who he signs with is rather beside the point. Manhattan's district attorney says he wants former Giants wide receiver Plaxico Burress to serve time in prison, the New York Post reported. Robert Morgenthau told the newspaper that Burress, who shot himself with an unlicensed gun in November, was willing to agree to spend a year in jail, but prosecutors insisted on two. ''We've always taken the position that he's going to have to go to jail, whether by trial or by plea,'' Morgenthau told the Post for a story in Monday's edition. Again, remember that this gun possession charge Burress was hit with has a two-years mandatory minimum. Sure, he can plead for less, but this doesn't seem a particularly difficult charge to prove: he brought the gun into the club and shot himself. That makes this next bit a bit strange to me. Brafman [Plaxico's lawyer] had previously said he no longer thought the matter would be resolved through a plea agreement and that prosecutors would take the case to a grand jury. He also said Burress would plead not guilty if the case went to trial. Again, not sure what a not guilty plea would get Plax. "He must be able to develop players. Good X's and O's can only put players in a position to succeed; they must also be taught the tools to actually do so. This requires that the coach be a great teacher of technique, drive, and desire (and if he is head coach he must be able to teach his players and his coaches those things as well), and to be a great teacher the players must also know that he cares before they will listen. Styles may differ -- compare Pete Carroll to Bear Bryant -- but the players must be willing to run through a wall for their coach." That's my answer. Other contributors Feldman asked included former GA coach Jim Donnan, Rod Gilmore of ESPN, Jim Hofher Delaware's OC, and Phil Steele ("My No. 1 judge of a coach is how often they outperform my magazine's expectations. "), among others. 2. Brophy chimes in with more on the "robber" coverage, as a jump-off from my recent bit on Va Tech's D for Dr Saturday. He includes some classic coaching tape of Virginia Tech vs. Syracuse in 1998 (McNabb was QB for the Orangemen). Notre Dame's problems with the rush appear to be two-fold: one, they just need to get better at blocking up front, and maybe BGS is right that just committing to the inside zone or some other play will make them better; and second, the pass game is not as dangerous as it was, as in 2005 Brady Quinn averaged an impressive 8.7 yards per pass attempt (unadjusted). If I were them I would focus on a simpler base of run plays: four or five at the max. Anyway, check out the original post. 4. I agree with the Senator: The Tebow-gate vote scandal was anti-climactic (Spurrier: Uh, I didn't care enough to do it myself and someone else either got cute or lazy and I never looked. In fact, I never look.) As I take the Senator's point to be, do we care if coaches don't really bother with these things? I sure don't. I always figured the "Coaches poll" -- in its various forms -- basically just stood for "someone over there at the coaches office and/or athletic department of that school," and that was good enough for me. It's more of an issue of who else you'd want to ask. 5. File this in the category of strange ideas: Zach Zaremba wants Southern Cal to switch to the spread offense. The Trojans have the athletes to run this prolific offense, so will they get behind the eight ball, or follow suit as so many teams have already done and install the offense of the 21st century? Powerhouses such as Texas, Oklahoma, Ohio State, Michigan, Virginia Tech, Penn State, Florida and West Virginia have made the switch. When will the mighty Trojans? Uh. There's more there, but the argument seems to be that USC isn't scoring as many points as, say, Oklahoma or Florida, and they haven't won a National Title in four years. But that doesn't make much sense: USC lost to Oregon State last year, in a single defensive breakdown, and Stanford the year before, in just a fluke game (many spread offenses have had similar breakdown games). Relatedly, this really can't be an issue of being wide open enough, as USC throws the ball plenty and does -- contrary to what the article says -- use four and five receiver sets (though not with the frequency of a team like Florida). The other reason of course that USC hasn't won a title game over the last four seasons (aside from facing Vince Young), is that the Pac-10 has let USC down: Florida, which won two of the last three titles, had a loss each season, and LSU lost two games. It's a strength of schedule thing. Anyway I'm getting off topic. The article is weird, and based on an equally weird premise: "The spread offense is the most popular offense in football today." That, to me, is a good reason not to run the spread. Look, the issue with pro-style offenses versus spread offenses is that spread offenses, where the quarterback is a dynamic runner, can get an arithmetic advantage. But that doesn't make dropback passing obsolete; if your guy is Peyton Manning or Tom Brady -- or the college equivalent, like Leinert or Carson Palmer were -- then you are more than dynamic enough. It's not easy to find guys with that kind of passing ability, but USC definitely can. What makes a good running back? How do you evaluate how good a team's run game is? What about rushing? . . . .In modern times, most RBs have a median carry length of three yards. I suspect that’s been the case for the majority of RBs for a long time. LenDale White and his 3.9 YPC last season? Median rush of 3 yards. Adrian Peterson and his 4.8 YPC? Median rush of 3 yards. But this would imply that the powerback, or at least the powerback who is not considered so explosive, is overrated. (Earl Campbell could run you over and break off big gains.) The point is just that the premium would not be on the player's results on the average plays, but instead on the longer ones. Some of this too can be the surrounding cast. Indeed, as Homer Smith has said, a runningback who gets 130 yards on 20 carries plays in a better offense (either because of him or for whatever other reason) than a guy who gets 145 on 35 carries. But this does all assume that average yards per carry is the most important stat. I'm not sure all would agree that it is. (In fact, I think the PFR Blog folks might not agree, as they ranked runningbacks and included their total carries and pure total yards as a key factor.) I'm not convinced that more carries means a better back or better running game, as that depends on the game situation (does the team get a lot of leads?) and also that the play-calling is optimal. I can also buy that on 3rd and 3, or third and goal, the point is to convert, not to help the average. Yet then how else can we evaluate running backs, or even a running game more generally? A perusal of the best offenses and running games in college tends to show that the best all have high yards per carry; not too many BCS teams have averaged fewer than 4.5 yards per carry, and several have averaged well over five yards per rush attempt (including sacks, which count against the run game total in college). But I'm interesting in everyone's thoughts on this question. How do you evaluate the running game? We give teams that play that kind of front [i.e. try to read the A-back's block to give them cues on what kind of blocking scheme Georgia Tech is using to block the various defenders "assigned" to the different possible ballcarriers in the option] something a little funky. When they play the eight-man front on defense, they tie the safety and outside linebacker to the release of the playside slot. They tell the linebacker if the slot runs straight up the field, the strong safety takes the quarterback and the free safety runs for the pitch. If the slot arcs, the linebacker stays outside on the slot and the safety runs the alley for the quarterback. That is not a bad way to play and is probably smart. If we find them doing that, we automatic with a safety call. We run the slot on the inside release, but he passes the linebacker and blocks the safety. [In other words he basically fakes blocking one guy and blocks a different guy, though it is subtle and designed to defeat what the defenders were taught all week to look for as a blocking tendency.] The defense has two defenders on the quarterback and no one on the pitch. We did that a bunch against Georgia in our last regular season game. Yup. The insight here is that it's not necessarily that Georgia didn't know the option, it's that they maybe overthought the whole thing, trying to guess and calculate what was coming when. 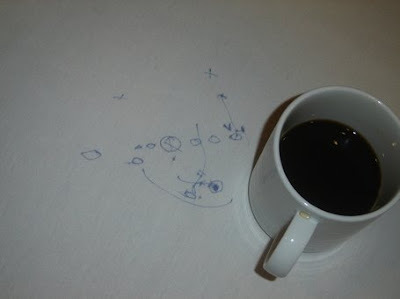 Sometimes the answer is just to keep it simple, read and react, and play football. 2. Consider the Lobster: And Other Essays, by David Foster Wallace. The guy could write. 3. Harper's Magazine. Just got a subscription. 4. The Most Of P.G. Wodehouse (Collection of P.G. Wodehouse stories). Another guy who could flat write. Many of these stories are ridiculous but that's often where their fun lies. 5. In Fed We Trust: Ben Bernanke's War on the Great Panic, by David Wessel (the Wall Street Journal's economics editor). It's not out yet, but looks good, and I will be reading it. I've avoided most of the new books on the economic collapse, but it appears this is the one to read (at least so far). I've also always enjoyed Wessel's work. Check out the videos on the University of Minnesota Libraries' tribute to the old Memorial stadium. Besides, who says the shotgun spread is new? Watch the highlights of any of the championship teams, including the 1940 one. You'll see lots of Notre Dame Box type sets, with lots of shotgun, faking, sprint out passing from the 'gun, etc. Looks pretty similar to what I see these days. In reading all the legislation during the 110th and 111th Congress that contain the word "windfall," (everybody needs a hobby) this definitely wins in the surprise category. The College Football Playoff Act of 2009 was introduced by Joe Barton (TX), and it has been referred to the Committee on Energy and Commerce. Now, before you start to wonder where Congress gets the power to redesign NCAA football, note how the legislation works. "A bill to prohibit, as an unfair and deceptive act or practice, the promotion, marketing, and advertising of any post-season NCAA Division I Football game as a national championship game unless such game is the culmination of a fair and equitable playoff system." Hmmm. Next we have the MLB change the name of the World Series unless they actually invite other countries to participate. Congress finds that. . . the colleges and universities whose teams participate in the post-season football bowls experience significant financial windfall including increased applications for enrollment, recruiting advantages, increased alumni donations, and increased corporate sponsorship that provides s competitive advantage over universities whose teams are ineligible or statistically at a disadvantage from the BCS bowl competitions because of their conference affiliation. Well, I'll let you quibble with this silliness, but this legislation, even if it passed (which it won't), wouldn't make the NCAA create a playoff. The BCS championship bowl would just have a different name. And it doesn't matter because Texas Tech isn't ever going to make it to the bowl no matter what the name is. You could call it "Bob" or even the "Texas Tech Red Raider Champions of the World Bowl," and Texas Tech would still never make it all the way. OK, that was an aside. 3. SEC media day. Just follow @edsbs on twitter. Thank me later. 4. ESPN will now let its reporters talk about the Ben Roethlisberger case. 5. Michael Vick, underrated? Brian Burke on the NY Times Fifth Down Blog. 6. The Senator asks: How far can the spread, spread? Good stuff, well worth it. O’Bannon left U.C.L.A. in 1995. Does the N.C.A.A. have the right to continue to make money off O’Bannon and his teammates without compensation? College merchandise licensing is a $4-billion-a-year industry, and the N.C.A.A. has cornered the market. An N.C.A.A. business partner, Thought Equity Motion, has called the N.C.A.A.’s video content archive “one of the most unique and valuable content collections in the world.” . . . The N.C.A.A. has had a sweetheart deal for years — using players’ likenesses, selling jerseys with popular players’ numbers and using athletes as uncompensated on-campus entertainment. Of course, athletes and their parents have had their own sweetheart deal, choosing colleges for sports and not for an academic fit. There is not a lot of sympathy these days for athletes’ woes — at any level. The perception is that scholarship athletes and their families receive a pretty good deal. Yes, the hours are long and daily practices make this a rigorous part-time job. “The general thinking among the public is that, ‘It could be a heck of a lot worse — you should be just be thankful for what the school has given you,’ ” Southall said. If that means eternal rights to your image, then so be it. And the public does not care. Just wait. Come September, college football stadiums from Harvard to Southern California will be filled with fans. Fans do not worry about steroids or licensing issues; they just want to be entertained. O’Bannon’s case and the others raise an old but still unanswered question: Who protects the college athlete? In the N.F.L., a players association protects players against owners. In major league baseball and the N.B.A., unions look after the players’ interests. The N.C.A.A. describes itself as “the organization through which colleges and universities of the nation speak on athletics at the national level.” The N.C.A.A. tries to act as mother, father and paternalistic overseer who supposedly knows what’s best for the young athlete. Every year, beginning in their freshman season, scholarship athletes are compelled to sign mountains of forms. How many athletes or parents or guardians read the forms? How many challenge the athletic department? College administrators and coaches pay lip service to “educating the kids,” but how many insist that their new recruits know exactly what they are signing? More to the point, how many recruits — and parents of recruits — have the nerve to tell Duke’s Mike Krzyzewski or Tennessee’s Pat Summit that, based on a lawyer’s advice, they are not signing anything granting a release of their image. All involved usually are too filled with gratitude and ego to consider reading between the lines. Ed O’Bannon wishes he had raised the question and resisted 15 years ago. Perhaps as a result of his suit, future athletes won’t have to. Again, I think even if the NCAA loses they will just get the players to sign a waiver of their rights as a condition of getting the scholarship. Is the NCAA infringing the rights of its current and former players? The plot thickens: Former UCLA basketball player Ed O'Bannon has now sued the NCAA over what he asserts is the NCAA's infringing use of his likeness in its various materials, including NCAA basketball video games. This case, unlike maybe Sam Keller's, is the real deal: Boies, Schiller & Flexner and Hausfield LLC are serious law firms, and the suit is a class-action suit, meaning that they are looking to join as many other former athletes as possible. And one twist does make this case more sympathetic, in that O'Bannon is a former player, no longer on scholarship, who continues to have his likeness used in subsequent editions of the video game through the "All-time" team features. He's not just suing about the use of his likeness when he was in college under scholarship. Not that I'm convinced that makes any difference. The bottom line is that everyone owns their own name and likeness, and any use of that name or likeness without permission that is infringing -- particularly for commercial use -- is impermissible. Now the question is what is infringing, and the NCAA simply maintains it hasn't infringed on anyone's rights. It hasn't yet had to explain why, though frequent arguments are that the kids are already compensated with scholarships or that the likenesses in the games aren't infringing enough -- you know, that Florida QB #15 that runs like a rhino and throws 50-yard bombs could be anybody. Neither is persuasive. The first looks just about foreclosed. Recently a federal appeals court decided that NFL Films infringed on John Facenda's distinctive voice when it used clips in advertisements for EA's Madden football. Facenda of course had that booming voice, and he had signed a contract with NFL Films. But in signing a contract didn't mean he waived all his rights for all time. Instead, as the Court said, "Facenda consented to participation in films documenting NFL games, not an advertisement for a football video game." The same might be said of the NCAA's scholarship athletes. One irony here is that the sports leagues -- usually always on the same side -- are now put on opposing sides with the simultaneous rise of these fantasy baseball challenges. In these cases, Major League Baseball and its players union have sued proprietors of fantasy baseball leagues, arguing that a player's name followed by his historical stats constitutes an infringing of publicity rights. These suits have not fared well, but they provide a nice contrast with the NCAA's position, which is that recreating the image and likeness of current and former athletes is not infringing. So what would happen if the courts ruled against the NCAA? I'm not sure how damages might work, but I would guess the NCAA would try to get its future players -- i.e. 17 year old kids -- to sign waivers of their publicity rights, forever. (Kind of like Facebook does for any photos you upload there.) But you also might get antitrust issues with, say, forcing all the various Universities to take on this policy, or then enforcement issues when, say, some WAC school offers its recruits the opportunity to play for them without having to sign away their publicity rights. It's an interesting mess. The NY Times's Fifth Down Blog has swapped out KC Joyner for Advanced NFL Stats' Brian Burke, who will be guest-posting there this week. I'll take that bargain any day. 2. "Out of the Blue." A documentary about the Boise State team that wound up upsetting Oklahoma. Quite good. 3. Three plays that shocked the world. Always worth a repeat view. 4. Brian Cook wants to pull his eyes out. ESPN's Lester Munson gets all hysterical and apocalyptic about the Supreme Court's upcoming decision in the American Needle case. The question involves whether the NFL -- composed of 32 different franchises under one umbrella -- should be treated as a "single-entity" for purposes of some of the anti-trust laws. If the NFL the Court deems the NFL a "single-entity" rather than a joint venture (as the lower courts did), it will be immune from some of this anti-trust liability. Munson thinks the world is ending; Cook takes a slightly more reasoned and calm approach, noting that the Supreme Court's ultimate decision is far from knowable (likely at this point even by the Justices). I'm with Brian, and for more insight check out SCOTUSBlog's explanation of the legal issues involved. 5. "A Beautiful Mind." Profile piece by Rob Moseley about Oregon's Chip Kelly. A good, thoughtful piece. Kind of buys into the "coach as genius" meme -- football is pretty simple, and players can always make you look smart -- but a good read. Courtesy of Richard, one of the blog readers, and I believe the write-up is by the inimical coach Hugh Wyatt. 7. Dan Shanoff on the inevitability of ESPN's taking over local sports coverage. Also check out the front-page NY Times article he addresses.